Asus has released the world’s first Skype Certified videophone which called as AiGuru SV1. The AiGuru SV1 is a part of Eee Videophone product family which dedicated to unlimited video calling over the Internet. The videophone features a large 7” displays, built in webcam, speaker and microphone and WiFi capable videophone that lets users to make unlimited video calls for free to others Skype users without PC. AiGuru has designed with icon based interface and intuitive button layout that make it easy for the users to call or receive Skype-to-Skype video call. Furthermore, the users also can join voice conferences and make call to fixed or mobile line at cheap rates. 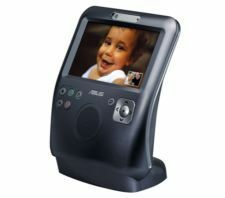 The Eee Videophone AiGuru SV1 is now available in North America from Skype’s online shop (www.skype.com/shop) for the price of $299.95 and will be available from Asus authorized resellers later this year. Consumers in Europe also can pre-order the videophone from Skype’s shop at the price of €269.95/£219.95 and will start shipping by late December. Beside that, the videophone will also be available in retail outlet in Asia Pacific later this year.